Low prices. OrangeSmile.com offers car hire service in Germany on the lowest-rate-guarantee basis, since we work with car suppliers directly. For your search criteria in Germany, we always select and show the best rental offers. The car reservation process consists of 3 simple steps: (1) search for available cars for your dates in Germany; (2) select your car type; and (3) fill in the booking forms. Once the reservation is completed, you will receive a confirmation voucher to your email address. During the booking process, please check your rental conditions. To pick up your car at the rental point in Germany, you need to provide our confirmation voucher, your driving license and a valid credit card. The final payment is normally carried out at the pick-up point. Our car hire points in Germany accept VISA, MasterCard, etc - please check your rental conditions. At the pick-up point, please read the handling manual and check the car for present defects. OrangeSmile.com wishes you a pleasant journey to Germany! The car hire reservation system OrangeSmile.com allows renting a vehicle in Germany within 10 minutes. Our largest database of car suppliers enables us to provide you a rental car in Germany at the cheapest rate ever possible. At rental locations in Germany we offer the following car sizes: mini, compact, economy, standard, premium and luxury. The following car types are available in Germany: Sedan, Hatchback, Jeep, Cabriolet, Coupe, Minivan and Minibus. Every city of Germany has much to offer to its visitors – numerous historic landmarks, masterpieces of architecture, religious shrines, interesting museums and many monuments that will amaze even experienced travellers. 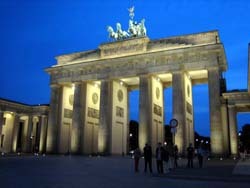 The Brandenburg Gate is considered the main sight of Berlin, the capital of the country. The building of the Gate took place in 1788 – 1791. Nowadays, the monument is an important historic object. Once known as a “Charlie “guarding point, the monument was turned into a museum dedicated to the Cold War. The majority of ancient buildings in Berlin were destroyed during the Second World War, only a few have managed to survive till our days. These are St. Hedwig’s Cathedral, St. Nicolas Cathedral, the building of Arsenal, Marienkirche and Berlin Zoo, the biggest zoo in the world. Many historic landmarks were restored literally from ruins – the Berlin State Opera, Bellevue Palace, Reichstag, Charlottenberg Palace and Kaiser Wilhelm Kirche. There are more than a dozen of interesting museums in Berlin, the most famous of which are the Museum of Egypt, the Prussian Palace Museum, Bode Gallery, Kulturforum, Museum Island, the New National Gallery and Pergamon Museum. Berlin suburbs are an interesting place, where travellers can find many unusual and fascinating places. The city of Potsdam is one of most notable places of interest there. In the 17th century the city was the residence of Prussian kings who lived in magnificent Schloss Sanssouci Castle. There are also several beautiful mansions that remind of that period. In addition to their architectural importance, these buildings are famous historic landmarks. The city of Bremen is a no less important tourist destination in Germany. Bremen is one of the oldest cities in the country. The most famous places of interest are St. Peter’s Cathedral, Town Hall, Market Square, Böttcherstraße Street and Bremen Cathedral. All the landmarks were constructed in the 13th – 15th centuries and feature different architectural styles. The best way to get acquainted with Hamburg is to visit Rathausmarkt Square. This is a large market square located in the centre of the city. Many large and famous trading chains are located there – Hanseviertel, Hansemarkt, Herhof and Neue Hansemarkt. Bavaria remains one of most popular resorts in Germany. This place is famous not only for its cultural facilities and historic buildings, but also for magnificent nature. The most famous park of the region is called “Bavarian Forest”. In the park, you will find several lakes, rivers and spacious alpine valleys. If you need to take or to return a car at night, it is better to search for a vehicle in airport locations (downtown offices in Germany usually do not work at night). Before making a reservation, please read the rental conditions of your chosen car. This will help to avoid unpleasant surprises at the rental office in Germany.